A friend started a new blog today and it was a great reminder that I have some catching up to do. This post brings me up to my 2016 finishes. I didn't finish many projects in 2016. 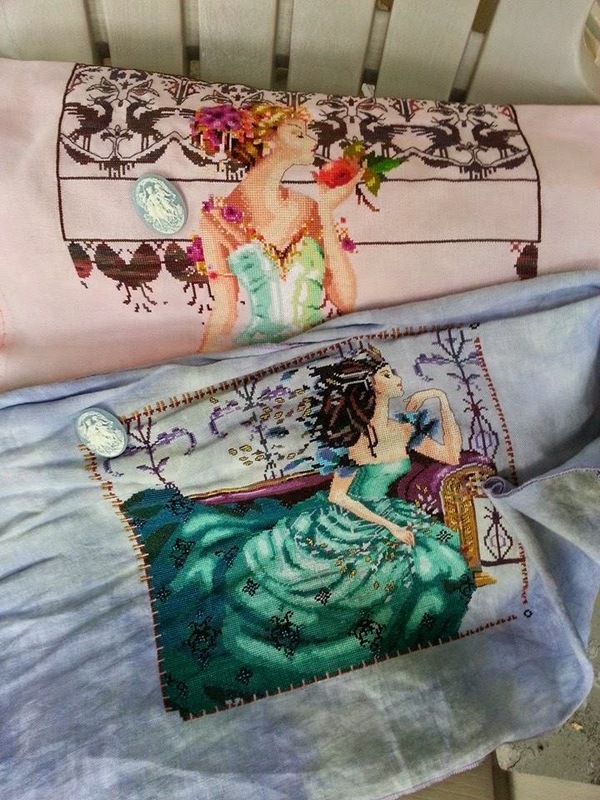 In fact I only finished two and it should come to no surprise that they are both designed by the impeccable Nora Corbett. 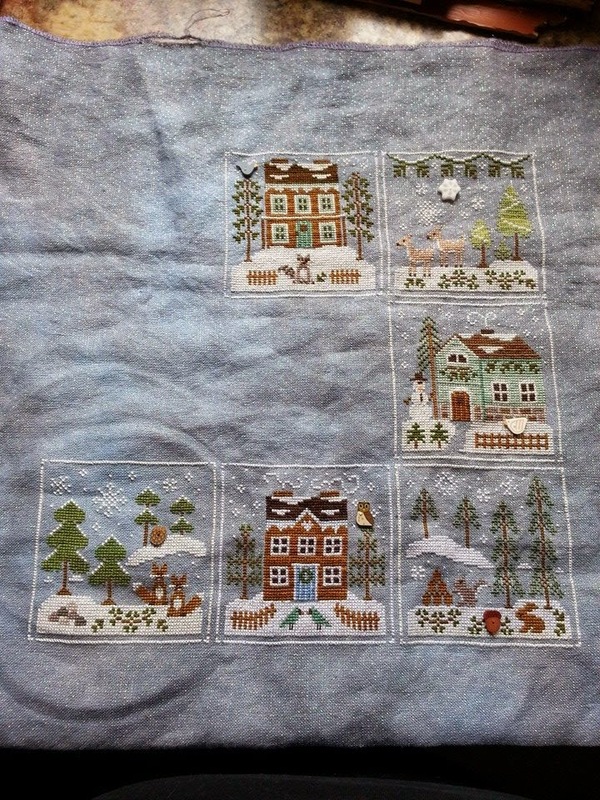 The first project may be one of my favorite pieces that I have ever stitched. I love a lot of my finishes, but this one I really connect with. 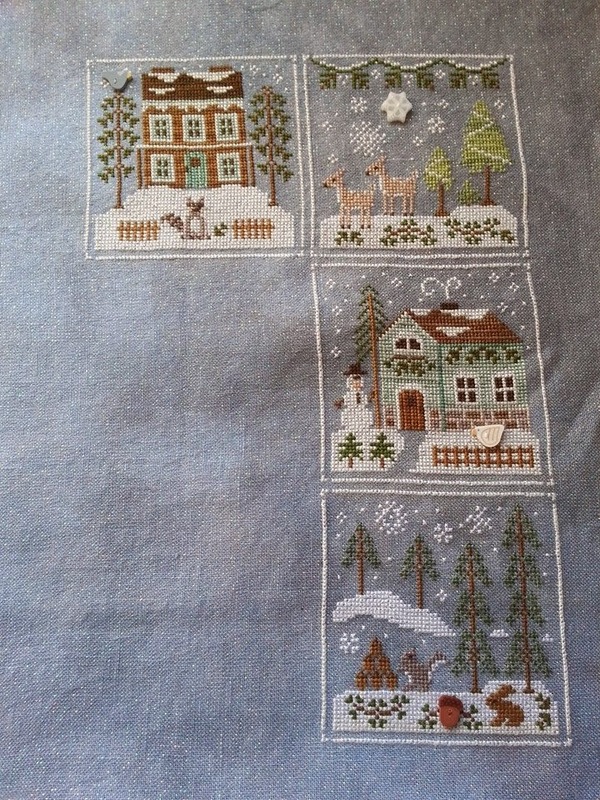 Florentina is a pattern by Nora Corbett under her Mirabilia line. I stitched her on this gorgeous piece of Enchanting Aurora 32 count murano by.... you guessed it... Crafty Kitten. 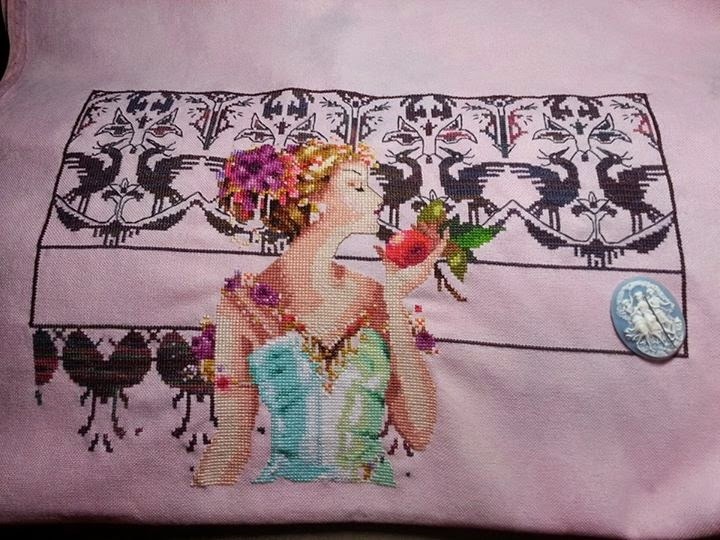 This is one of the most delicious pieces of fabrics I have ever worked with. So beautiful. Tina, as I called her had an elaborate back story that I weaved in my mind while stitching her. Tina was a free spirit - a bit of an odd ball compared to her dignified family. 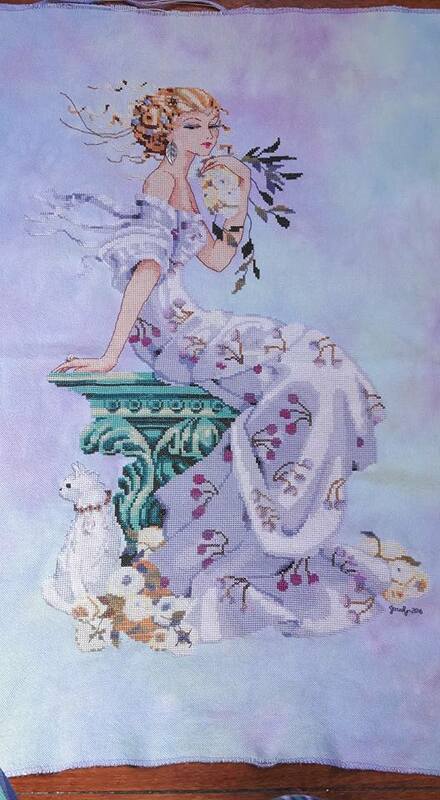 She loved nature, flowers, animals and most especially the wind in her hair. She loved to run off and hide in the gardens where she could breathe and just be herself - away from the drudgery of social life. I added to this piece some mixed materials that I had picked up at Bead FX in Toronto. I added the irredecent butterflies in her hair, the silver flower - and my favorite touch - the feather earring. 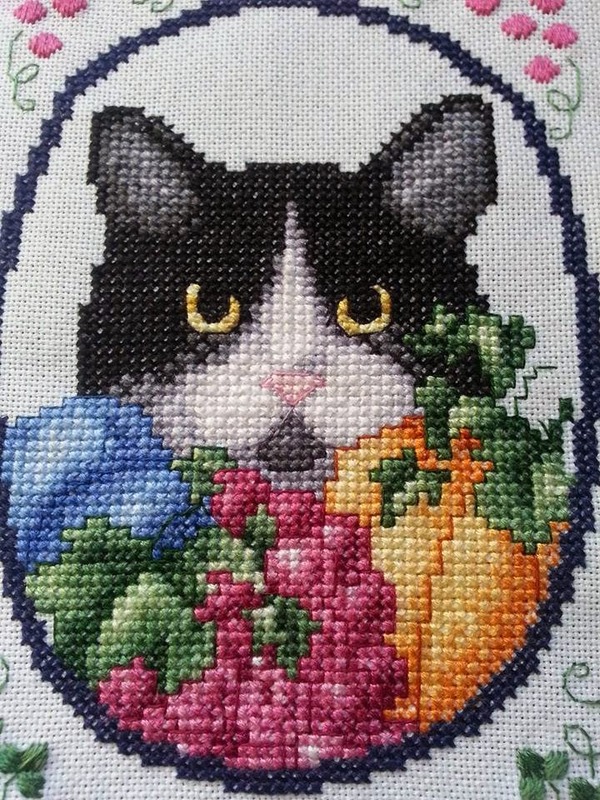 Her lovely cat was a joy to stitch. I added a special little Swarovski crystal fish. This cat is pampered but also loves to run free in the garden - much like his Mistress Tina. If you notice Florentina has a huge rock on her hand. Don't worry it is her right hand. It is a family heirloom. She is a little too spirited for married life yet. The dress on Florentina is huge. It was a lot more than I had anticipated and it took awhile to finish up. I did enjoy working with the colours - they were very calming. I have a frame for this. I need to pin and stretch it and get her up on the wall. I just think she is perfection if I do say so myself! I also had one other finish in 2016. That was Coral Charms from Nora Corbett's La Petite Mermaid Collection. This was one of those patterns that jump out at you one day. I wanted something bright and quick to counter Florentina and Coral won out. 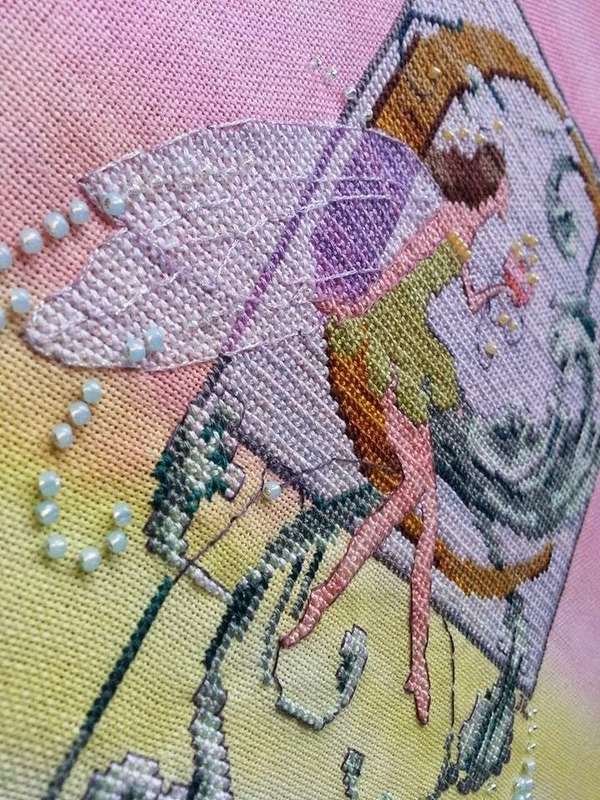 This fabric is Fairies Meadow by Sunny Dyes Fabric. My guess is 28 count. I did not stitch the long tendrills that flowed from her tail. 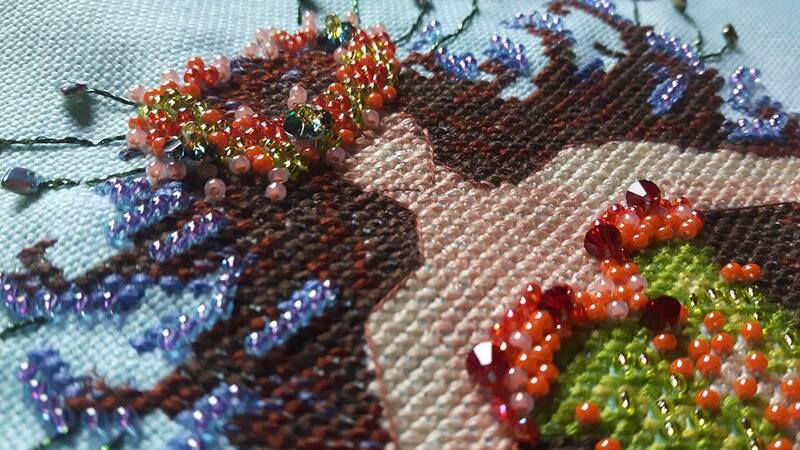 I used beads called dragon scales at the ends of her hair. 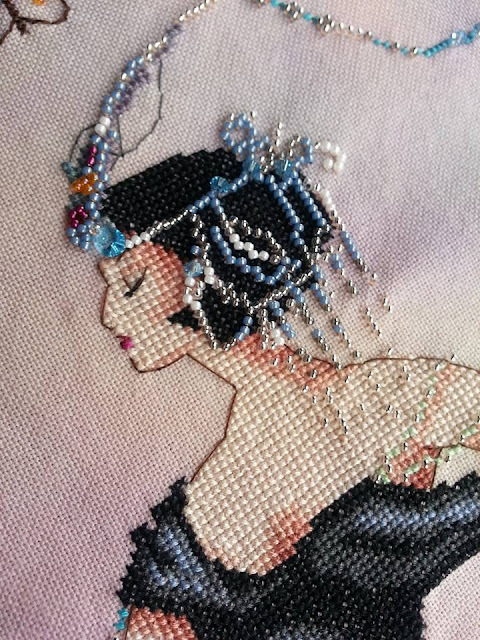 I added additional bicone beads and more to her head dress... I blinged her out as per my usual. She was a fun stitch and didn't take up too long. Thank you for reading through my post and I hope you enjoyed these pieces! That is all I managed to finish in 2016. I actually started 2 other larger pieces towards the end of 2016 that only were finished in 2017. More to come on those soon! I am just going to go ahead and pretend it hasn't been three years since I made a blog entry. I am sad that I let it go for this long without updating things.The truth is that I still get inquries about things I posted a long while ago. It is nice to see that people do still come upon my blog. So thanks to anyone that is still out there reading. So what have I been up to for the last three years? Life is a lot of the same goodness. 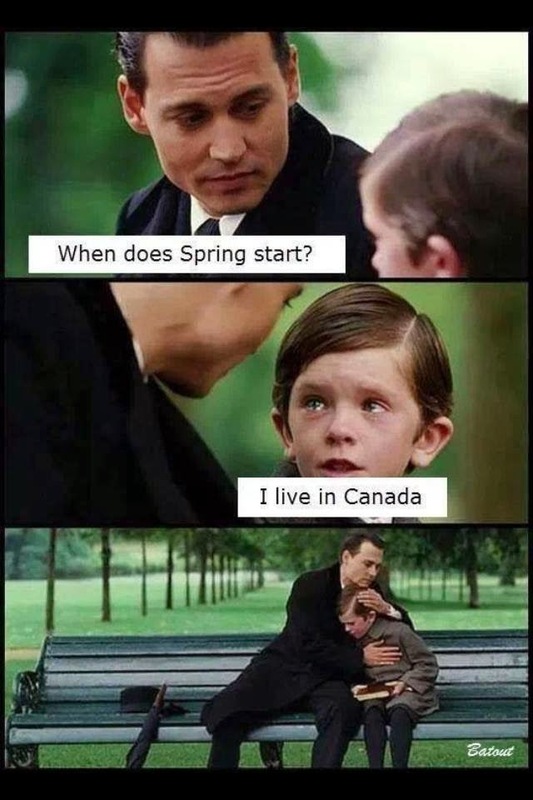 I live in Moncton, New Brunswick on the East Coast of Canada. My two kids and 2 step kids are growing like crazy. I have two kitties; Bella and Zoey. I just celebrated five amazing years with John. Life is beautiful. I think I am going to share some of my older work and try to work my way up to current day. I will try to remember as many details as possible. At the Met, or Maddy as I call her is such a gorgeous and elegant piece. 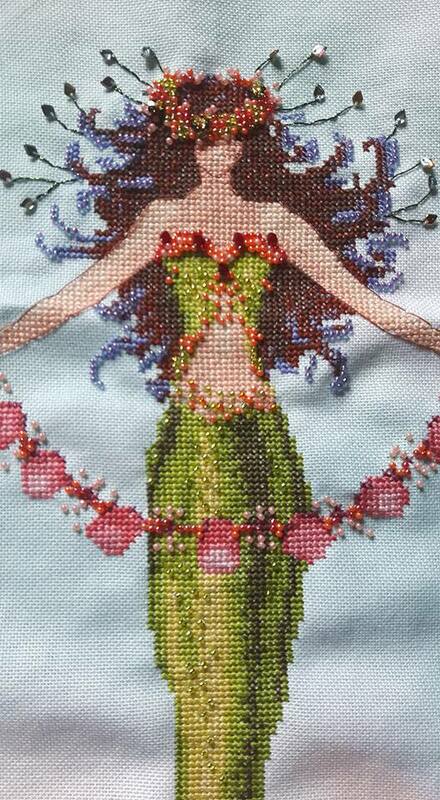 I stitched her on 32 count murano on Hint of Autumn by Crafty Kitten. I called her Maddy because she had a touch of regality that reminded me of my Great Aunt Maddy. Aunt Maddy was always the aunt that bought us our fancy dresses for school concerts and such. To this day a fancy little dress is an "Aunt Maddy" dress. 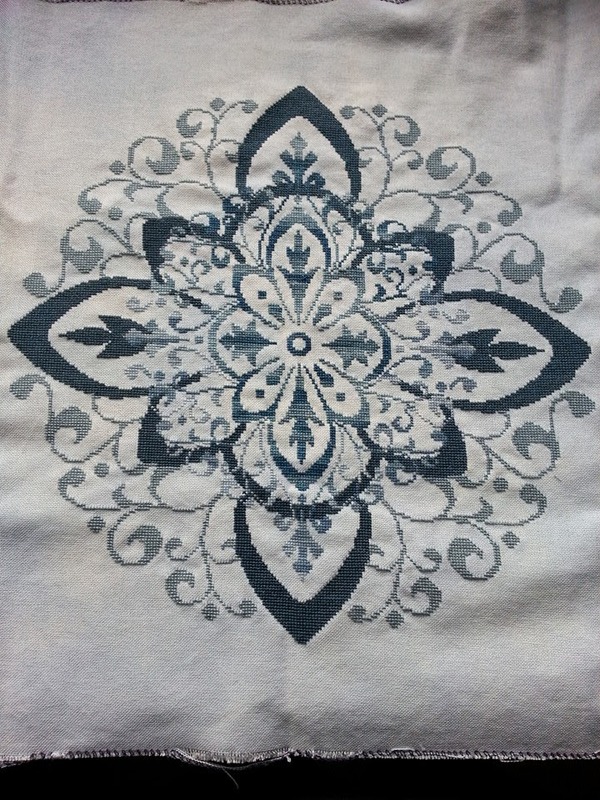 I did make a few minor changes to this pattern. 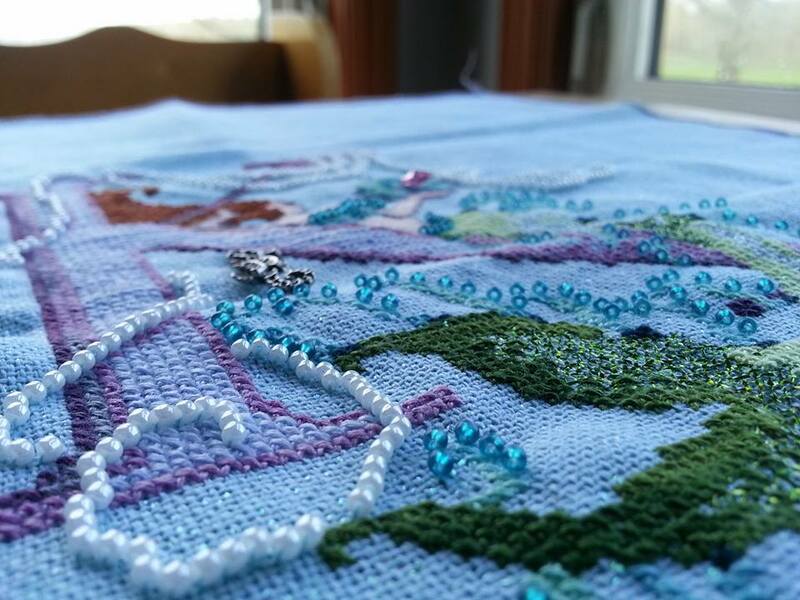 I mostly added more beads. 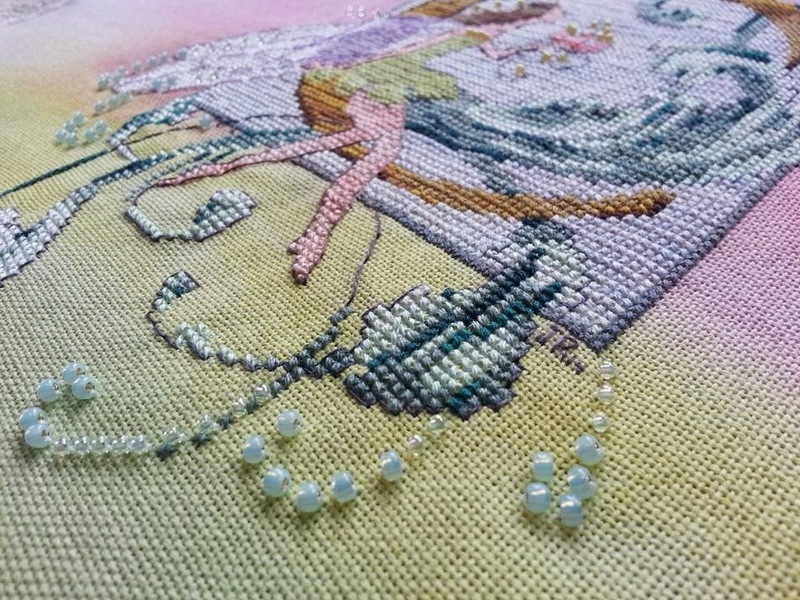 Again, having access to Bead FX once or twice a year in Toronto has really changed my stitching game. 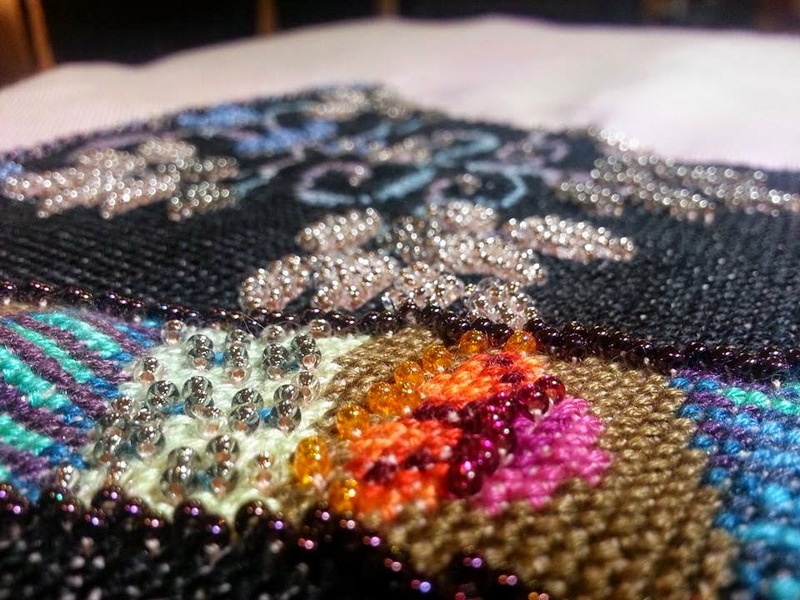 Every project is an opportunity to add embellishments. 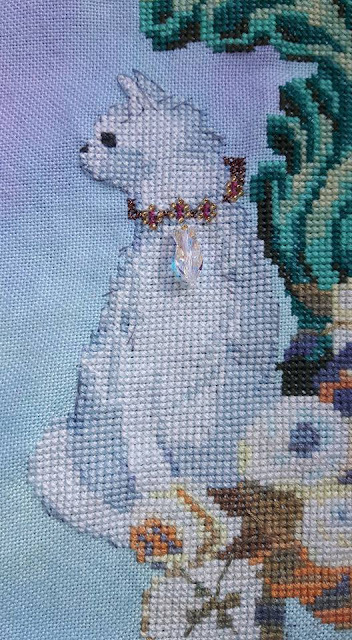 I know I added a few to her head dress and extra crystals to the beads draped over her arms but the main change was that I did not stitch the tassels. I used an interesting flat glass bead. 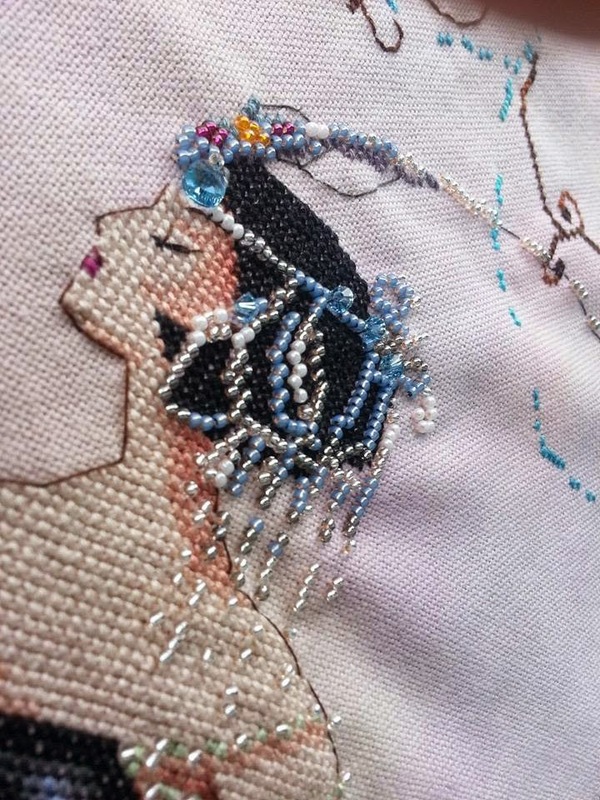 Oddly, when I saw this bead I knew it was perfect for this project. This design is just dripping in oppulence and I do really love her. 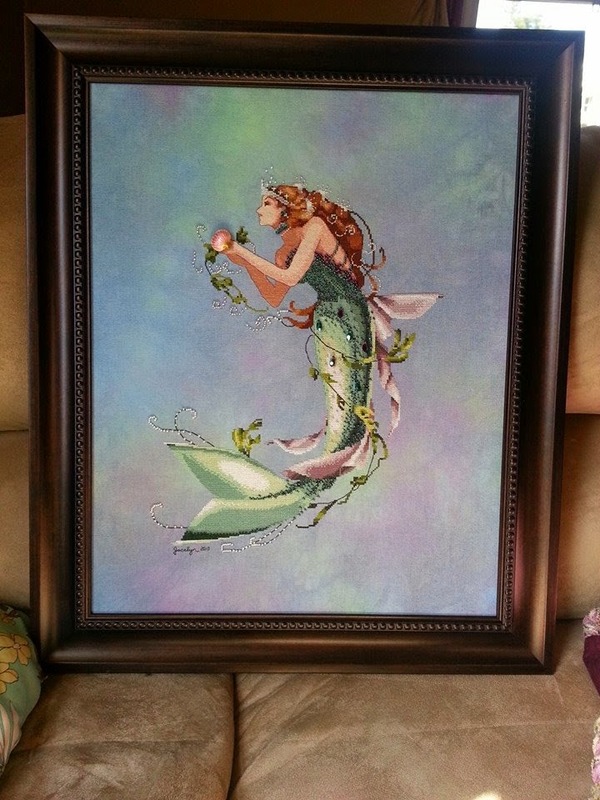 She is the first piece I have ever had someone offer to buy from me... for A LOT of money, but I honestly couldn't part with her and I know I wouldn't be able to restitch her. For me each piece is such a snap shot in time and trying to recreate just wouldn't work for me. 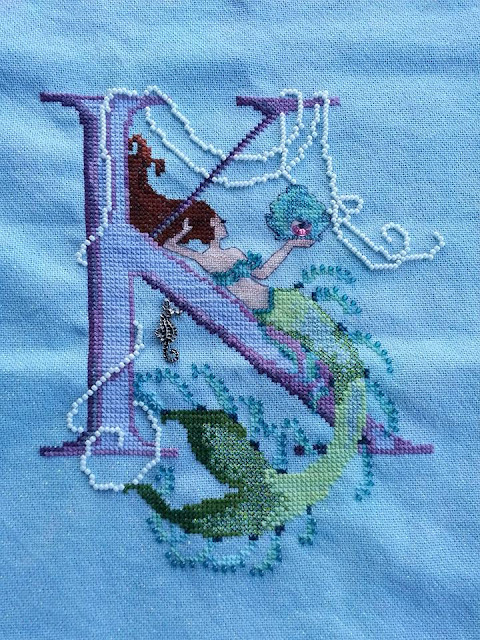 Letters from Mermaids is a series designed by Nora Corbett of Mirabilia fame. 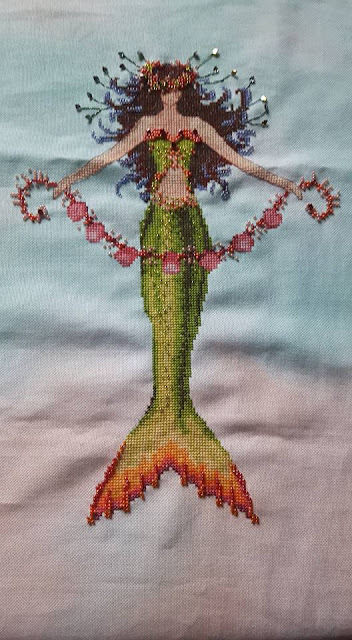 I decided to stitch this design for my daughter Kailee. The Mermaid series was released after the Letters from Nora fairy series (of which I stitched the C for Chelsea). When I stitch a piece for my daughters I allow them to choose the fabric. Wow - Kailee certainly chose a perfect piece! 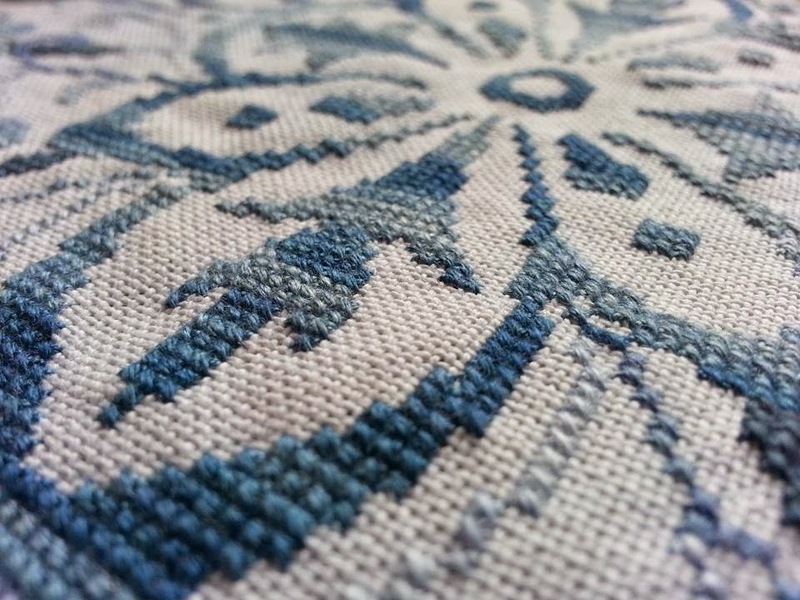 This is Glacial Ice on 32 count opal linen, by...you guessed it... Crafty Kitten. This design fits nicely on a fat eighth or a 13x18" piece. As per usual I changed a few things. I added the sea horse and the pink Swavorski in the shell. I changed the hair colour to match closer to my daughter's hair. 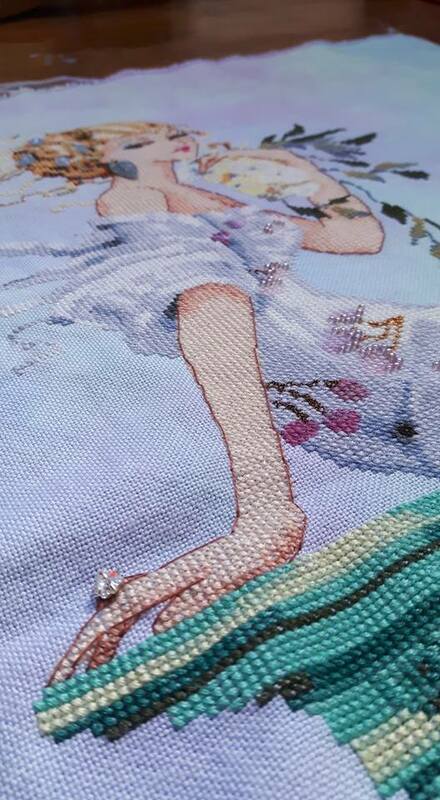 I also chose to stitch the skin over one. I like this because it gives the piece a lot of demension. 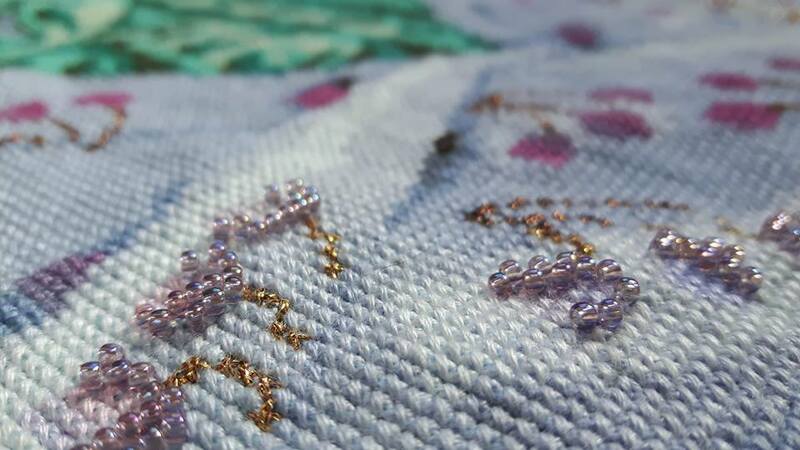 These letter patterns are not only gorgeous - they are fun to stitch. The make great gifts for anyone. Well it is May 1st, 2015 and I am almost a year behind on blogging. Damn - time flies. 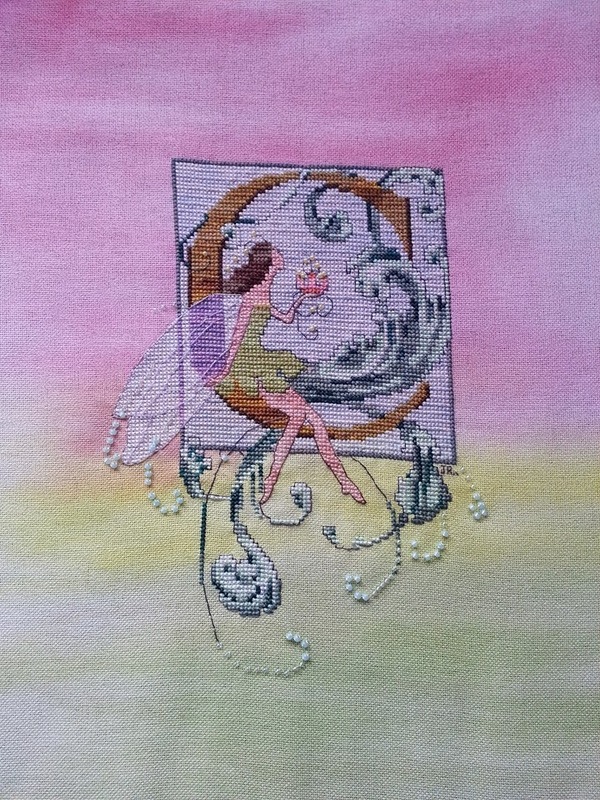 I have gotten myself into a place in my stitching habits where I find myself starting many things and finishing few. Although, I do have projects that I have completed since my last post almost a year ago. The Frosty Forest is complete. I'm so very proud of this piece. It was fun getting the patterns and buttons monthly and I never lost interest in it the entire time. I did change the block in the middle. I took a house from another Country Cottage design and changed the colours to match the other blocks. The other elements in the center block are just snippets from the other patterns. 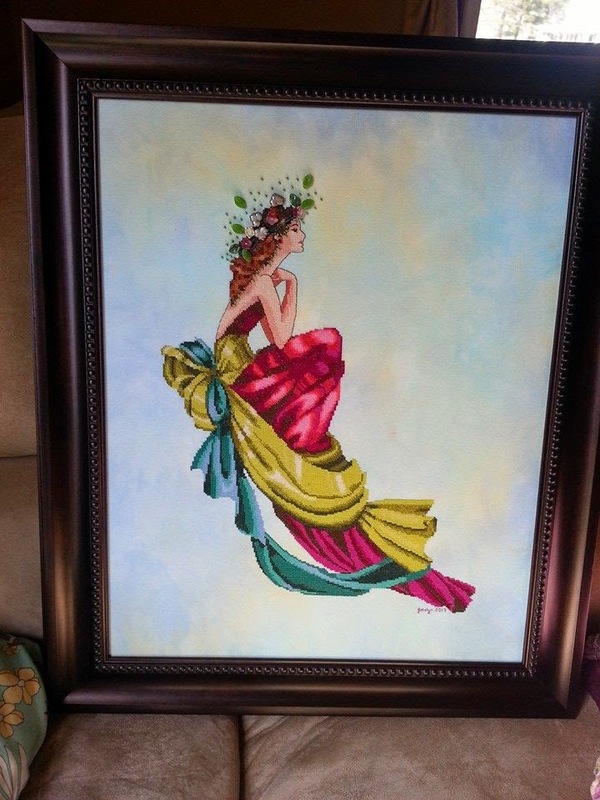 I was also able to buy a frame from the local farmers market for this piece. I really like how it turned out. 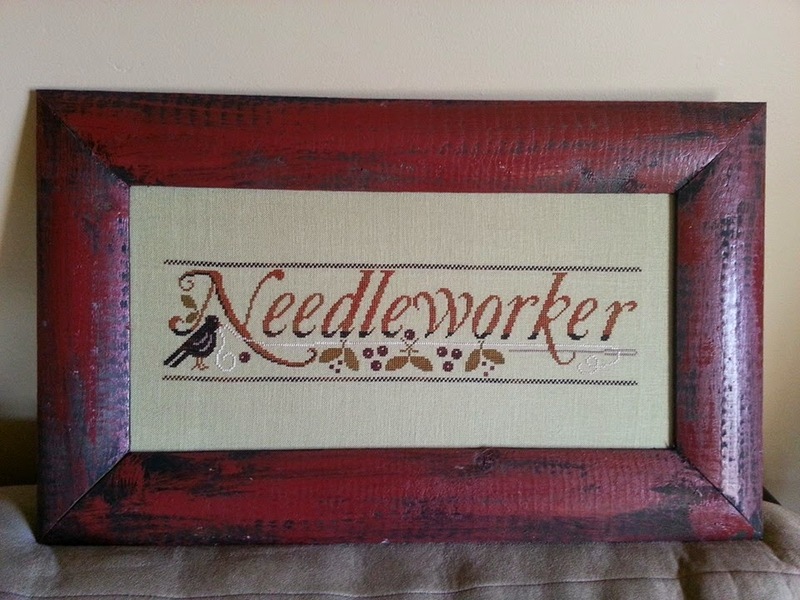 I also secured a frame for Needleworker by Little House Needleworks that I stitched awhile back. Getting a piece framed is so satisfying. 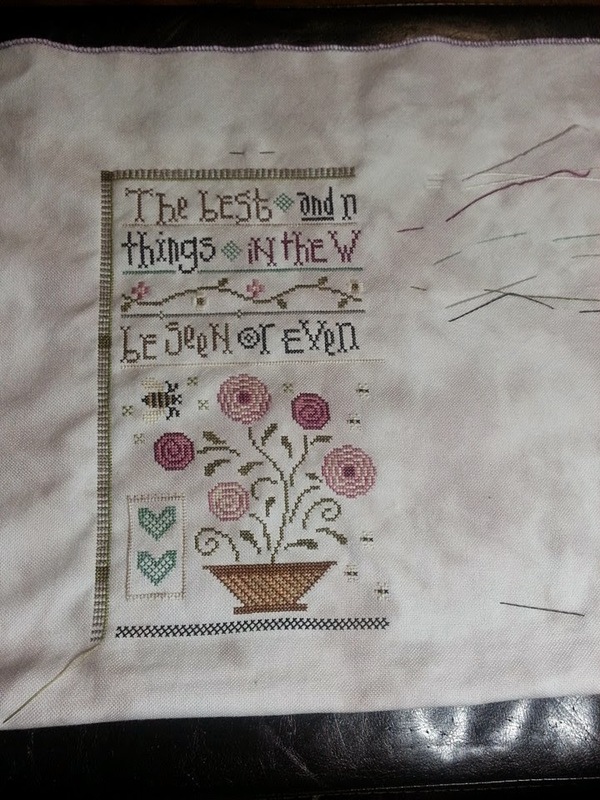 Another piece that I was able to complete was something I stitched on a whim. 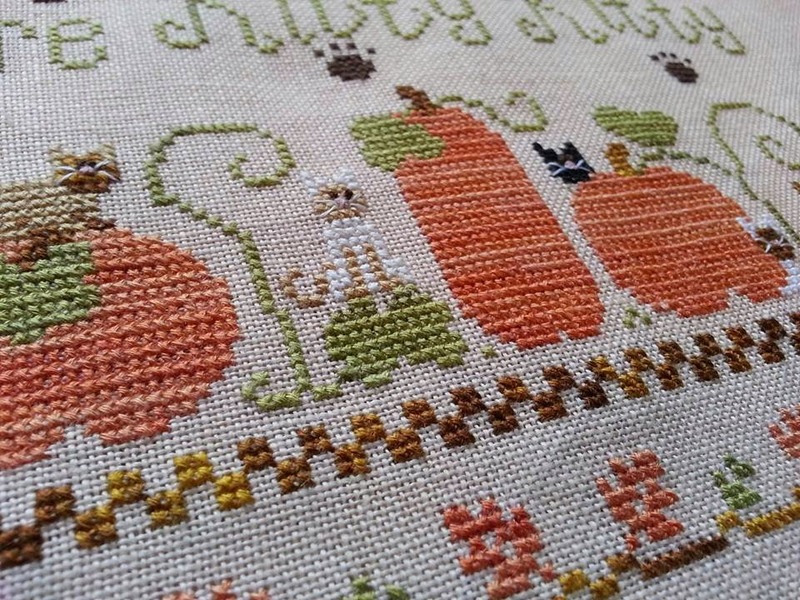 It was fall and the time was right and it had such adorable kitties on it. 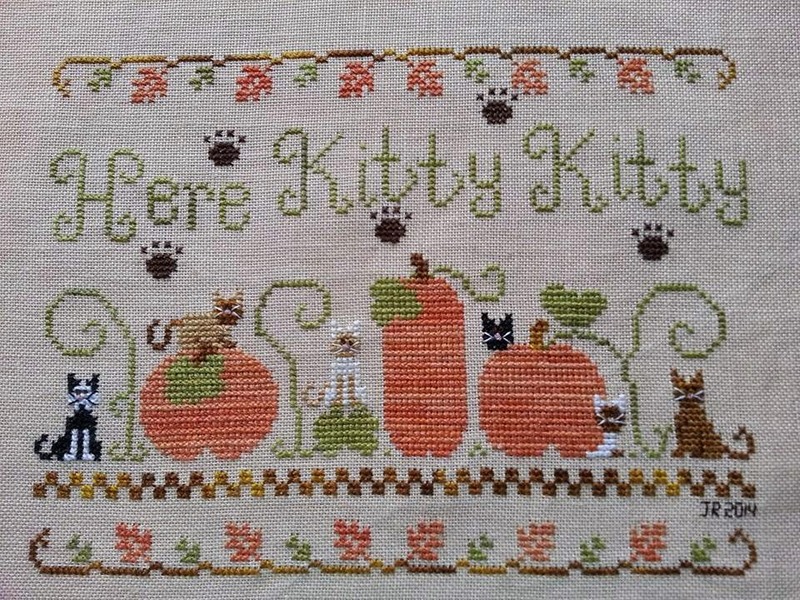 Here is "Here Kitty Kitty" by County Cottage Needleworks. I did change some of the kitties to match some of my favorite feline friends. My goal is to make a little pillow out of this I think. 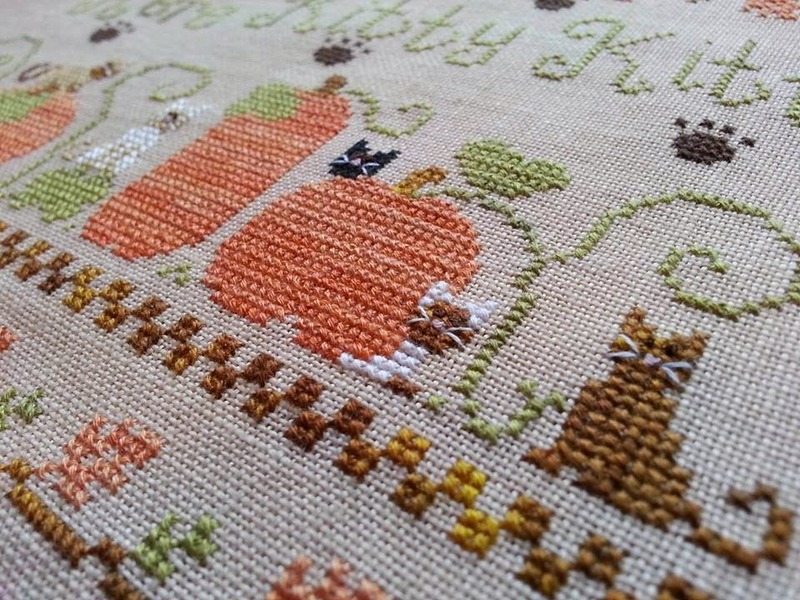 Here Kitty Kitty by Country Cottage Needleworks on 28 count Light Exemplar Linen. 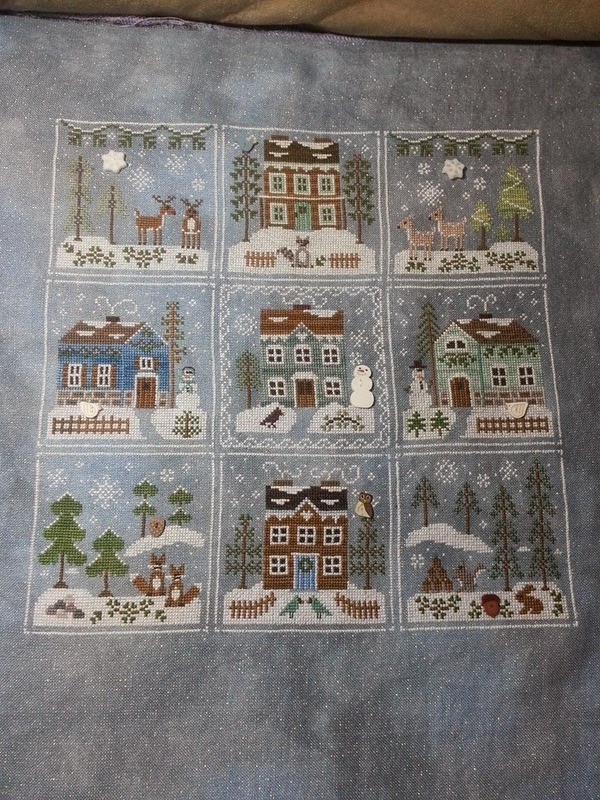 The only other full finish I had was called Woodland Sampler by The Frosted Forest. I have no real reason for stitching this other than it just really appealed to me at the time and it was so cute and whimsical. 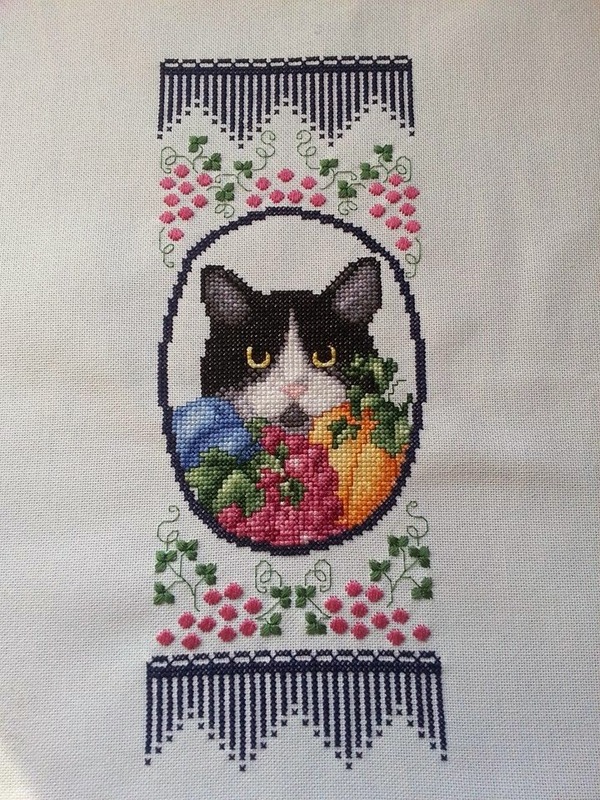 I stitched this on 28 count Lemon Sorbet jobelan by Crafty Kitten. I also did a RR block for a friend. I chose Cassiopia from Mirabilia. I changed her direction and made her my own a bit, but she turned out very pretty, if I do say so myself. 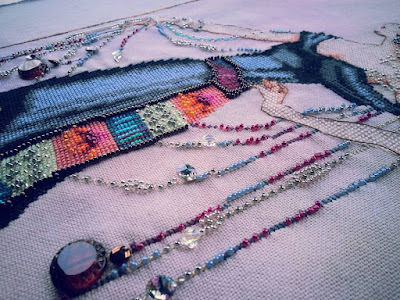 At the Met by Mirabilia: my current and active project. 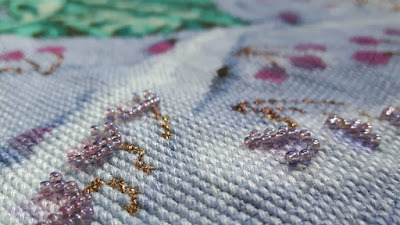 I feel like I'm getting close to finish and I don't want to really trump my finish - so here is a close up for you... 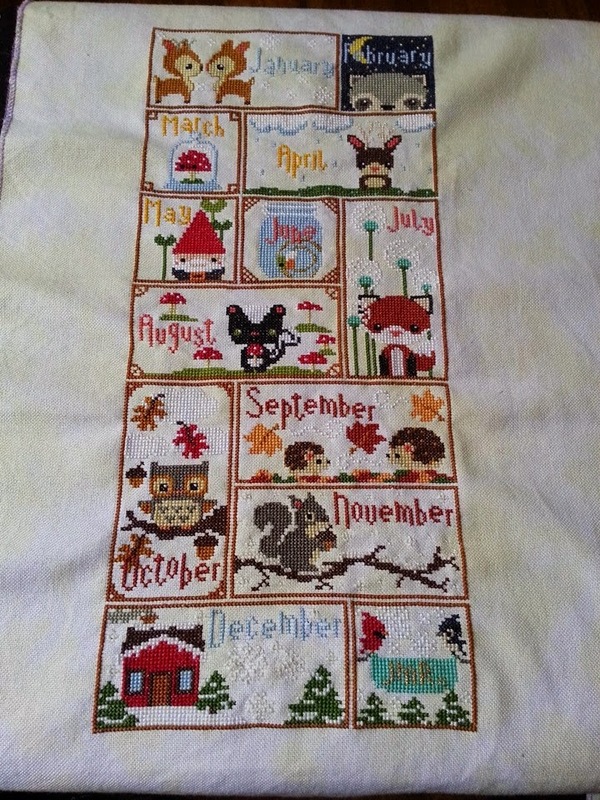 I'm using Hint of Autumn by Crafty Kitten for this one. Finally I am working on a huge project for me. 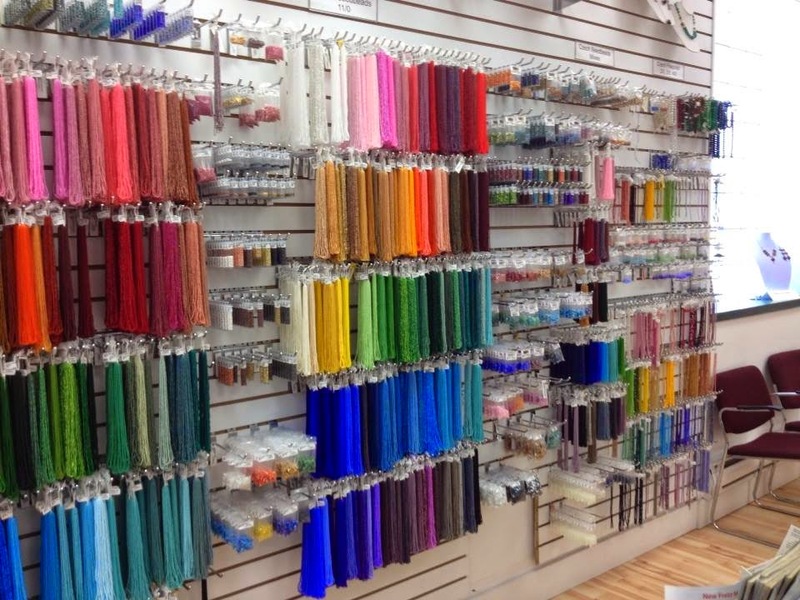 It is a pattern by Colour Cascade Fabrics. I won it on Facebook. 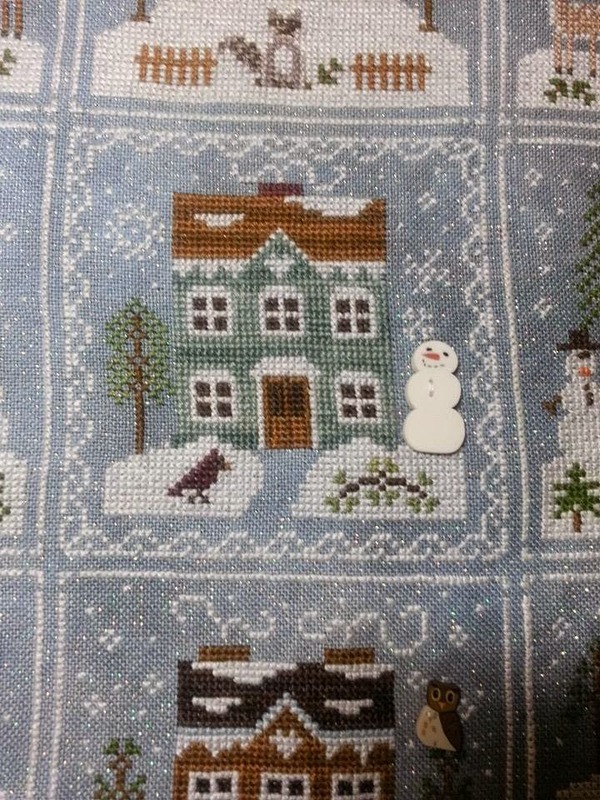 I decided I wasn't going to take the prize unless I was going to stitch it. 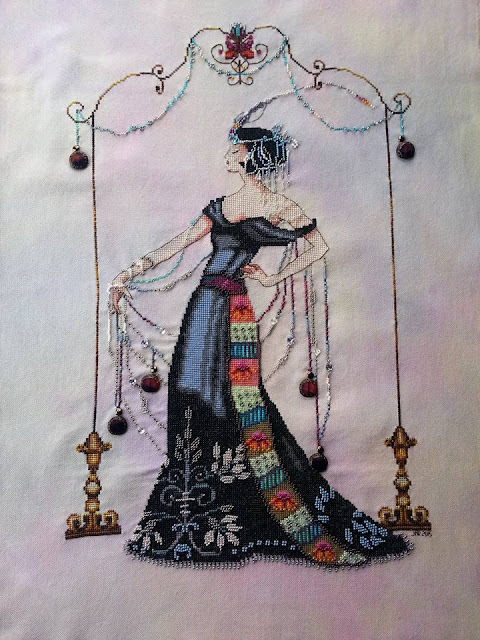 This is called: The Lovely Lady - the pattern is 55 pages long. I'm doing it 2 threads over 1 on 25 count. I think I will be working on this one for years! See... a lot on the go. I'm trying for finishes at this point. Once again, a loose promise to blog more often. Feel free to share links to the blog and if using them please give me credit for the photos. I haven't watermarked them because I am hoping I don't really have to. Thank you for reading. 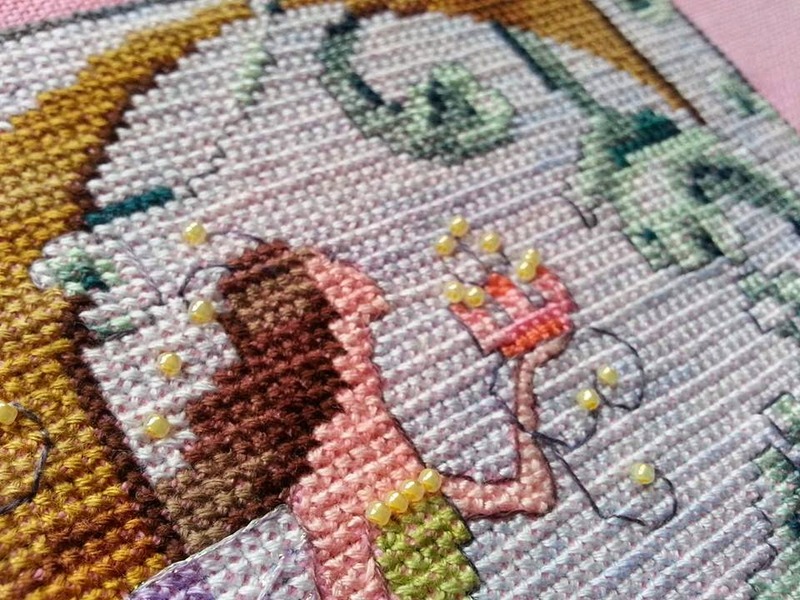 I hope you get lots of stitching time. My work has an annual training conference in Toronto towards the end of May. Lucky for me, my best friend lives in Toronto - well I'd be luckier if she lived in Moncton here with me... But I always try to take advantage and stay in the city a little longer and spend the weekend with Sharon. 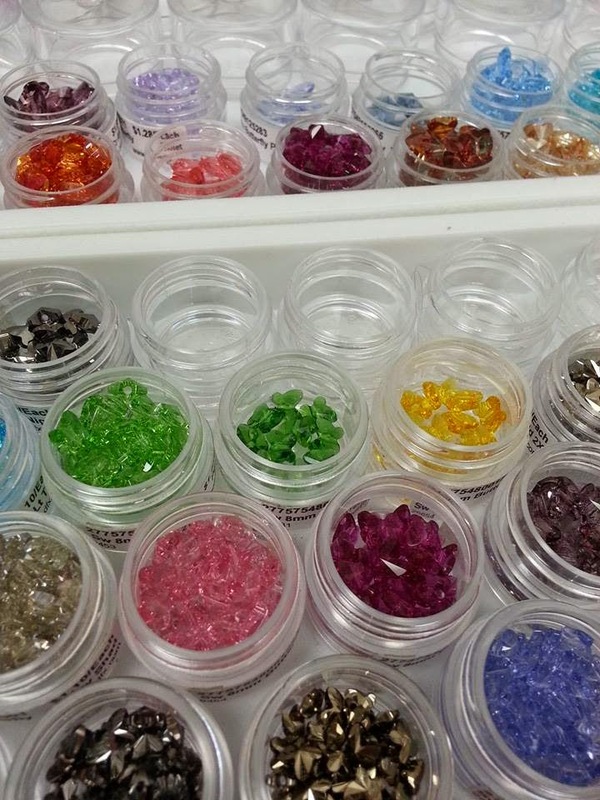 We get up to lots of trouble - mostly this involves beads, bling, chocolate and well...some real crazies on the public transit system. 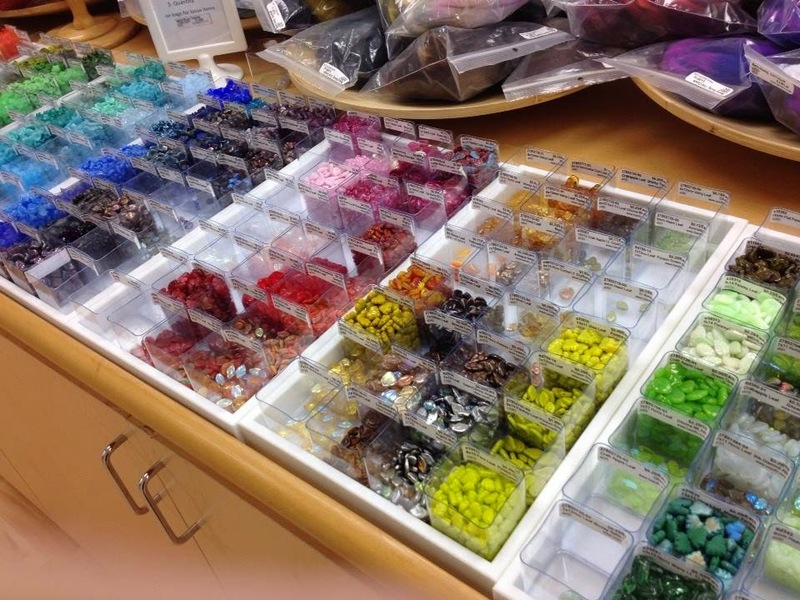 While I was in Toronto our must stop was to BeadFX. We probably spent well over and hour there picking out little treasures to add to our stash. 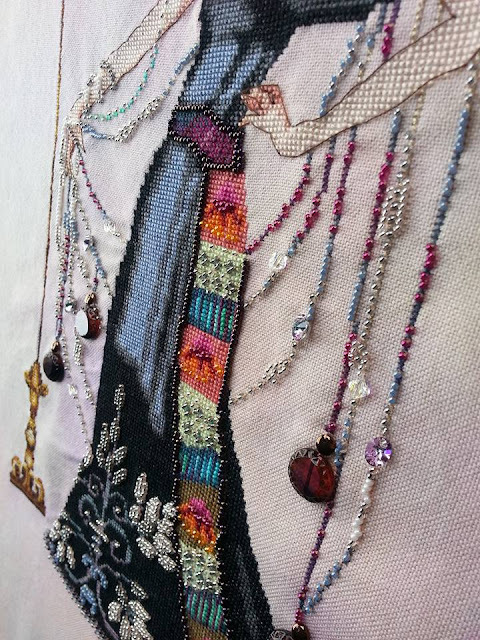 I really enjoy these embellishments and use them to enhance my pieces and make them unique. Sharon, like myself is a huge Mirabilia, Nora Corbett fan. She was working on Cassiopeia when I was visiting and I was working on Persephone. Although, foolishly we didn't get a picture of us together, we did take a picture of our pieces together. 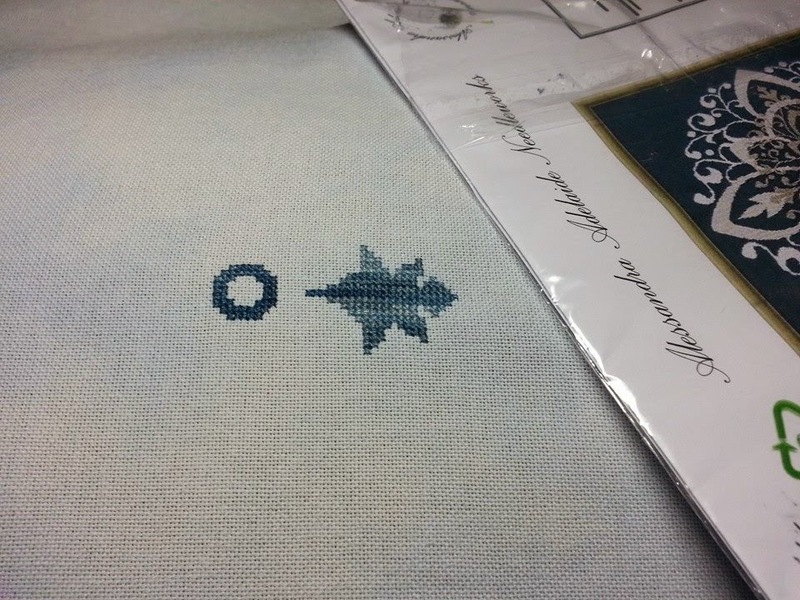 Of course, both of these projects are on Crafty Kitten fabric. Sharon's is on Nov 2013 Ltd. Edition and mine is on Apricot Blush. I also brought with me my Frosty Forest piece. I am caught up again and awaiting my next pattern from Colours By Lalena to arrive. I also have some new Gingher scissors on order from Lalena with some other goodies.... let's just say we keep an open order going, shall we? Three more blocks to go! Right before I went to Toronto I actually finished Abrabesco by Alessandra Adelaide Needlworks. 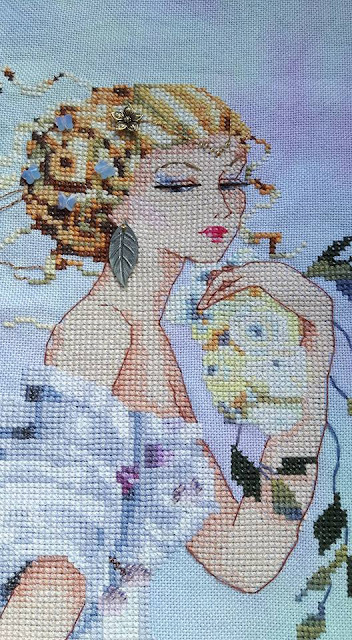 This is stitched on 32 count lugana Ice Princess by Under the Sea fabrics. I used DMC 930, 932 as well as a Caron Waterlilly called Polar Ice. 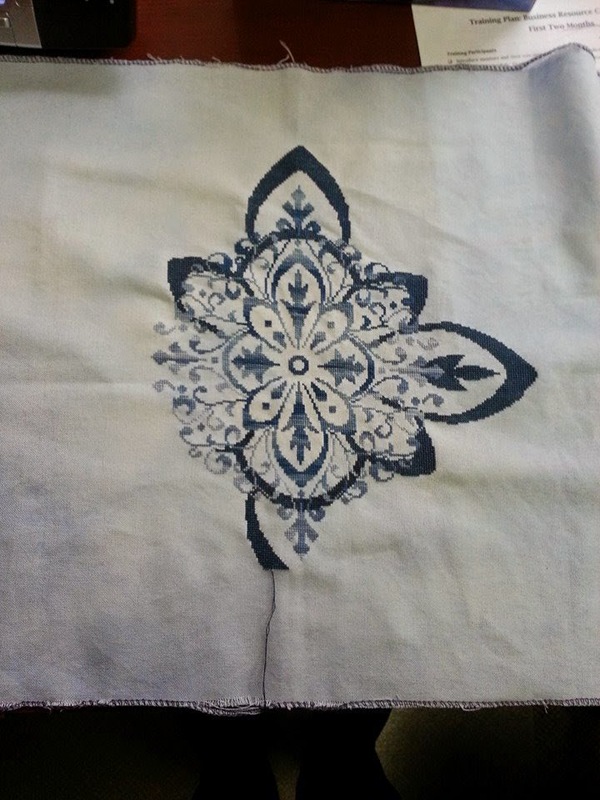 My favorite thing about stitching this design was becoming more familiar with the designer. Alessandra is an active participant in her Facebook group and she loves seeing her work come to life in all colours and forms. She is a lovely, caring, engaged designer and I'm looking forward do doing more of her work in the future. So right now I am still working on Persephone and I am working on Rosewood Manor Autumn Sampler as well. I am itching for a new start but I am trying to hold off because the Frosty Forest installment will be here soon and I have letter's J and K from Nora's new mermaid series coming. I know my daughter Kailee is going to want me to do her letter "K" for her. This is Letter's By Nora - Letter C. I did this for my daughter Chelsea. 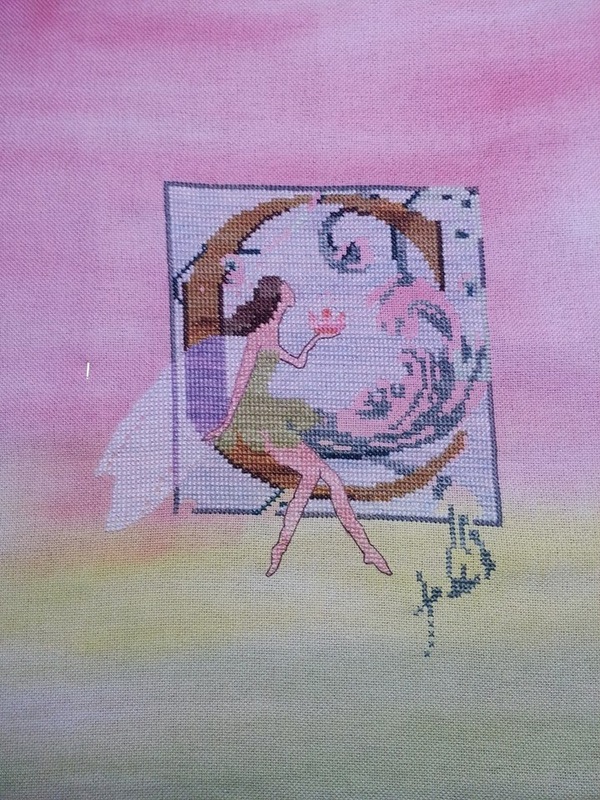 Chelsea is seven and she chose this fabric - High Noon by Sunny Dyes Fabrics of Youthful Hand Needleworks. I think this turned out really sweet. 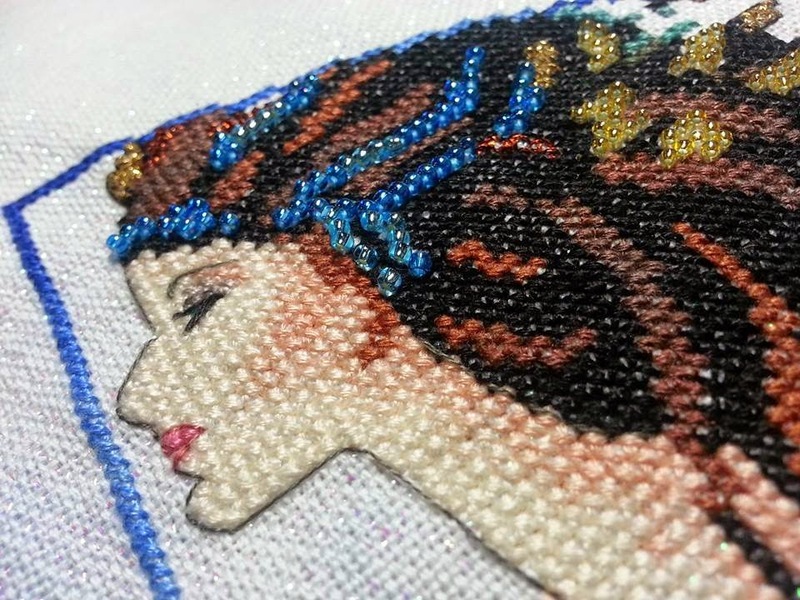 It has a lot more back stitching than a typical Nora design, but it really made the design pop. 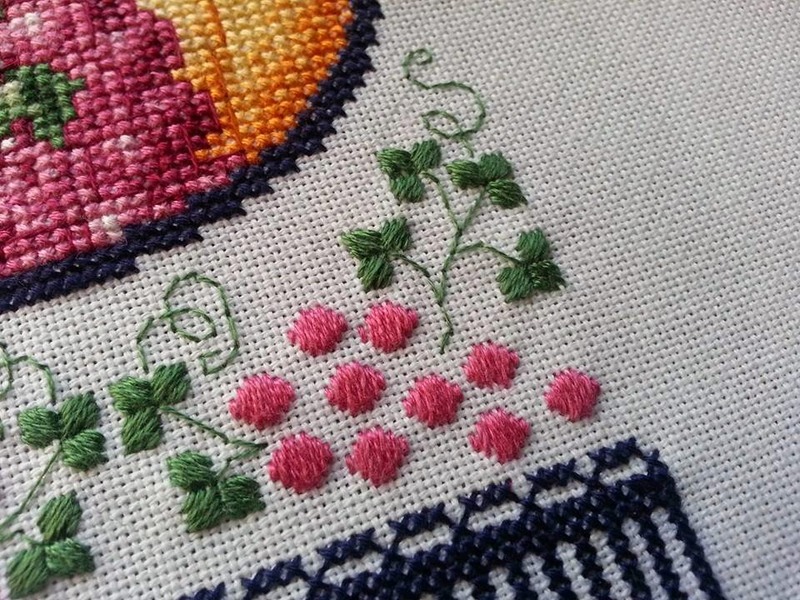 I used for the most part the called for threads, I did substitute the flower for a variegated DMC that I had. Chelsea chose this as well. I love this shot. I like being able to see the blending of the colours on the fabric mixed with thread and beads. 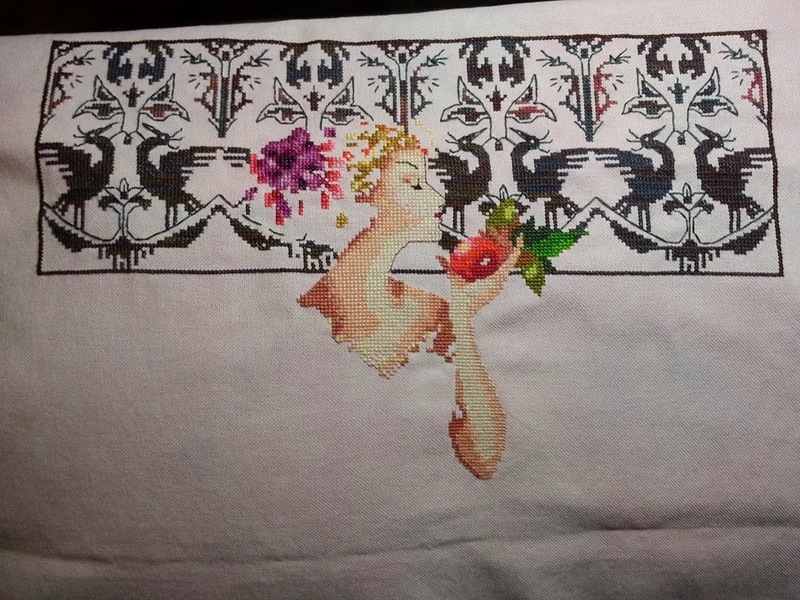 I have also continued to do work on Persephone. 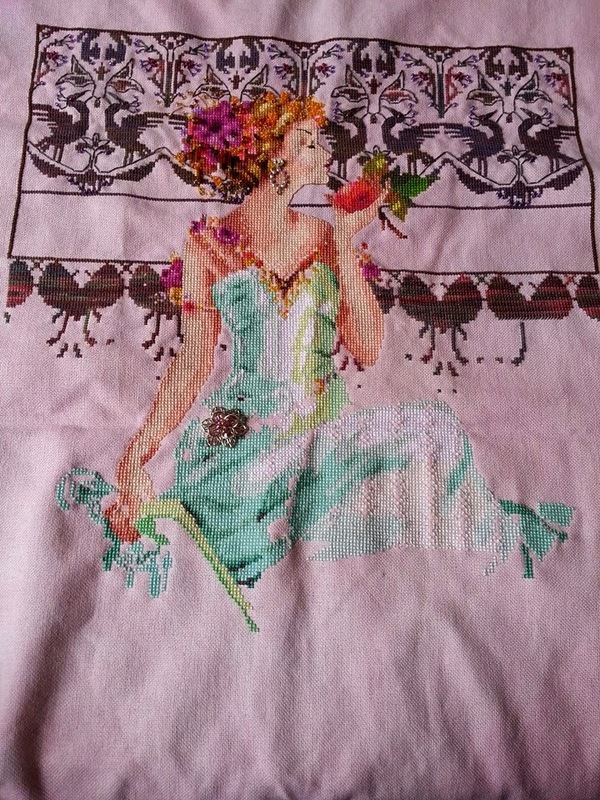 I have had a lot of fussy bits to do....her hair, her collar on her dress, the flower on her arm....glad to be done those parts. 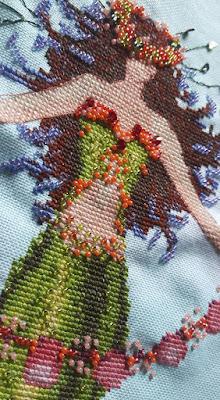 I think she is turning out really pretty and I am back to enjoying working on her again. Also, I really immersed myself into the AAN piece called Arabesco. It is my first AAN and my first abstract design really. I am done the center part - which I chose Polar Ice Waterlillies by Caron. 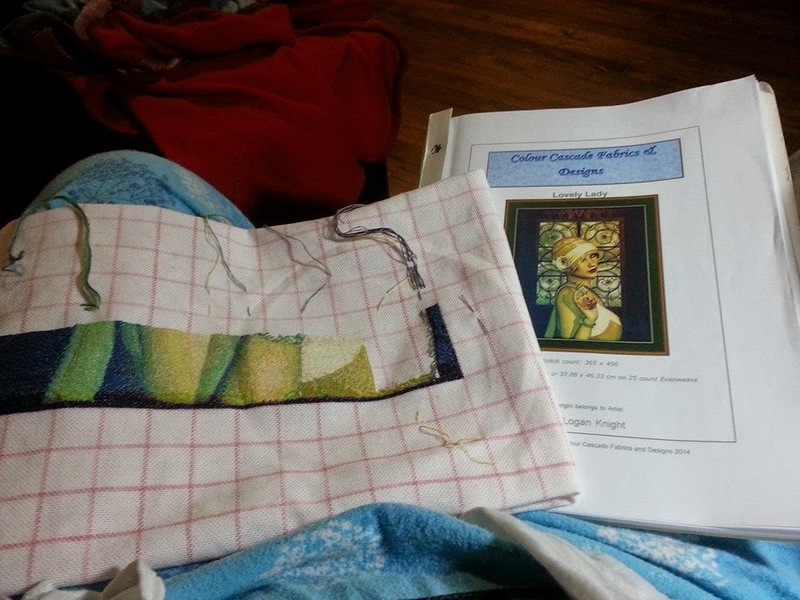 I am doing the middle layer in DMC 930 and the outside layer will be in DMC 932. 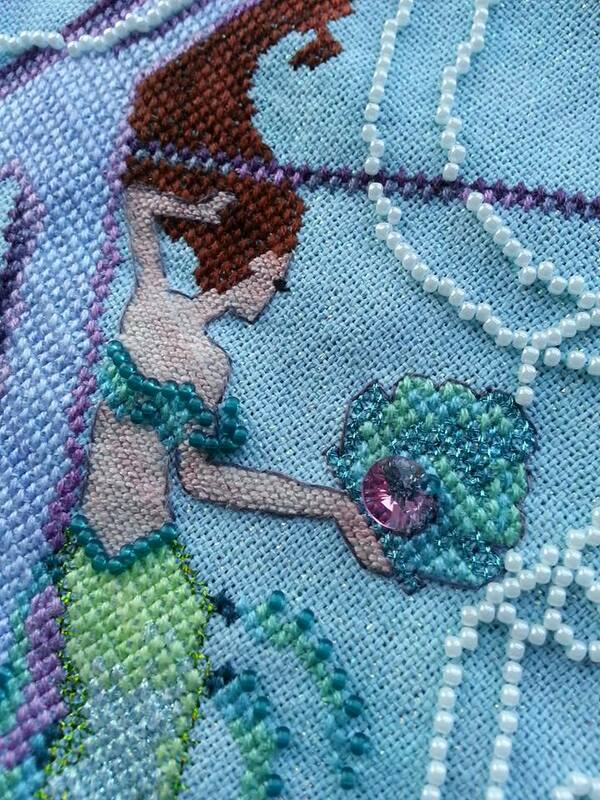 This piece is being stitched on Ice Princess by Under the Sea fabrics. Finally a little Easter treat for myself. I got some pieces framed. Our local framing shop will allow you to bring in store bought frames and put the pieces in for you! 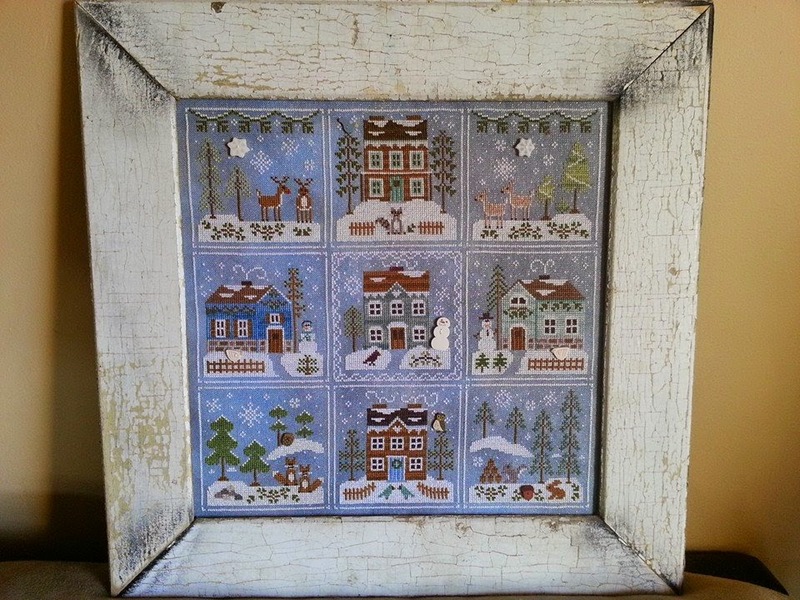 I picked up frames for these after Christmas with the intention of doing it myself, but I never got around to it. So finally I dropped them off and a few days later I'm so glad I did! Here is Charlotte and Queen Mermaid. 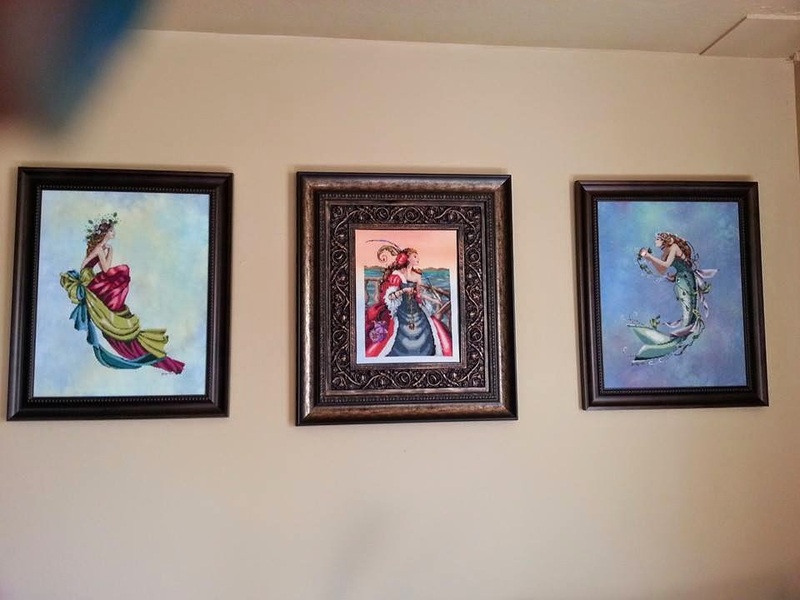 As you can see they sit nicely on the wall with my Red Lady Pirate. I am anxiously awaiting a package from Colours By Lalena which has a whole bunch of goodies for me to work on...mainly my Rosewood Manor Autumn Sampler, my next installment of the Frosty Forest and two new Nora Corbett patterns. 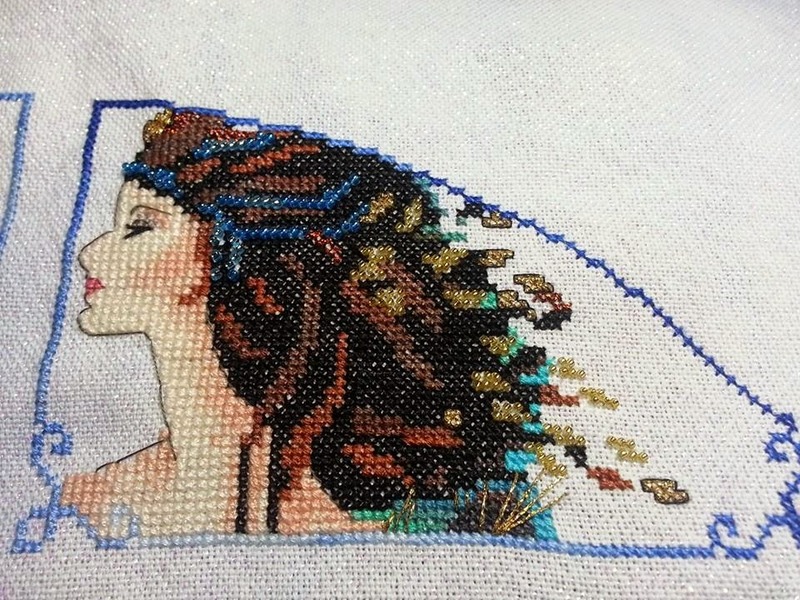 Remember to just keep stitching and thanks for reading!